One big advantage TU Coaching Tools give you is the ability to plan ahead, even for the entire season. 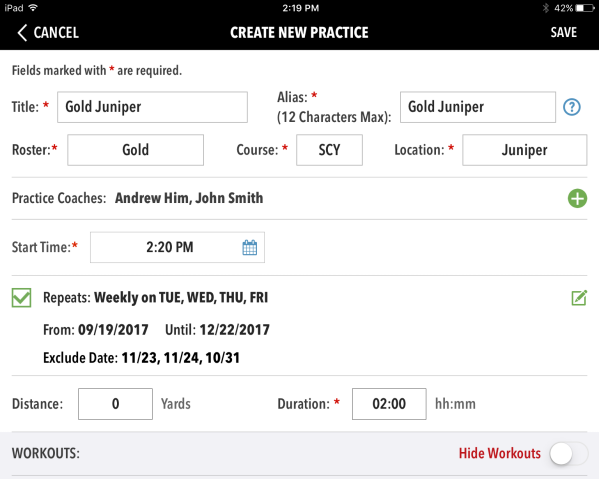 Throughout the season Coaching Tools will track and record all the workout statistics of your team, roster groups, and all the way down to the individual swimmer based on the workouts they attend and test sets you track. This starts with adding your practice calendar. 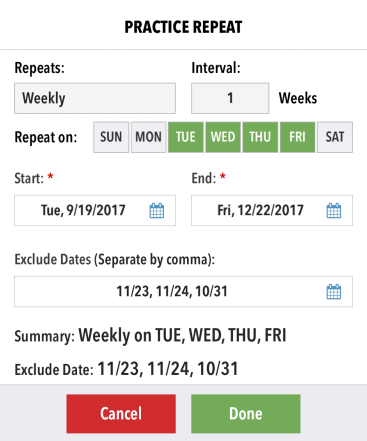 This allows you to assign workouts, take attendance, check in swimmers to their workouts and capture all your practice data. So, let’s begin by adding in your practice calendars for each of your roster/workout groups. You can also schedule practices in TU Web Coaching Tools. Tap > Coaching Tools > Practice Calendar in the upper left. Tap (to the right of TODAY on a phone) or NEW PRACTICE (tablet). Tap in the Title field and enter a practice name. Notice it fills in the Alias with the same name, which is displayed in the Calendar. Tip: Since long Titles get cut off in the Alias field, change the Alias if needed so you can make sense of Practices in the Calendar, such as avoiding the appearance of duplicates when you have similar long names. Select a Roster, Course and Location. Choose a starting date and time, Done. Distance: You may want to leave this blank for now since it varies from day to day. Duration: Enter your practice length, such as 200 (for 2 hours), Done. Tap next to Coaches, select one or more coaches, DONE. Tap the days it repeats on, such as TUE and THU boxes. Tap the End calendar field, choose an ending date, Done. If you won’t be practicing certain days, tap the Exclude Dates calendar field, select all the days to exclude, Done. 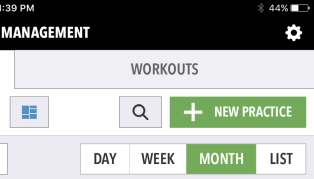 You can turn on Hide Workouts so that only other coaches can see the workouts. This is typically done per workout until you are ready to display one. Repeat this process for each additional roster group. You have many tools at your disposal to filter, view and manage your practices. Quick filters — In addition to the usual SELECT SEARCH FILTER button for viewing multiple rosters and so on, there is a set of quick filters available. On a tablet, tap any of the VIEW BY drop-downs to filter by a coach, roster group and/or location. On a phone, click the eye list icon to filter by a coach and/or location. Tap the orange No Workout dot to see only practices that don’t have any workouts attached. Tap the red Test Set dot to see only practices that have workouts with test sets. Tap the ScrapBook icon to see only practices with attached ScrapBooks. Search — Tap the magnifying glass icon to search by name for practices. Time frame navigation — Tap TODAY to jump to today’s date. The arrows (tablet only) move back and forward in the selected time frame on the right, whether a day, week, or month at a time. Calendar view — Sets the amount of practices to view. In all of them, tap a practice name to view/edit it. Swipe left and right in the Day, Week and Month views (abbreviated as D, W, M and L on a phone) to move forward and backward through the calendar. 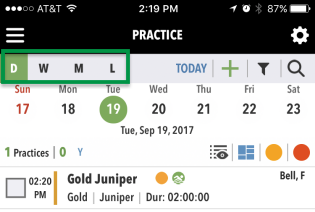 If you see a green swimmer icon by a practice, it means the athletes in your personal account are in that practice. This is more for the benefit of parents. DAY — View all the practices today. Select one or more practices, then tap in the green bar at the bottom to RUN (view the practice in whiteboard mode and time any test sets), TAKE ATTENDANCE or CANCEL the practice. WEEK — View all the workouts in a week. MONTH — View all the workouts in a month. 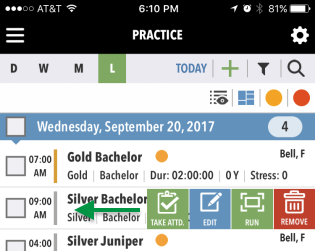 On a tablet, on days with more practices than can be displayed, click the X more link at the bottom to switch to Day view and see all practices that day. 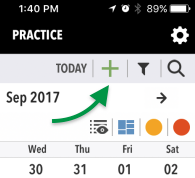 On a phone, tap a date to see the practices for that day at the bottom, and use the arrows at the top to cycle through months. LIST — Functions the same as the Day view, but lists the next 30 days. Swipe left on a practice to display controls to TAKE ATTD, EDIT, RUN or REMOVE the practice. Now with your practices scheduled, it's time to write workouts.